I love this stamp from the March Market Fresh Kit from Market Street Stamps. Guess what? You can still get your hands on this kit and this EXCLUSIVE stamp found in it........Find it HERE. As soon as I got this stamp in the mail, I wanted to try this out. Check it.......I stamped my lightbulb image on the wrong side! 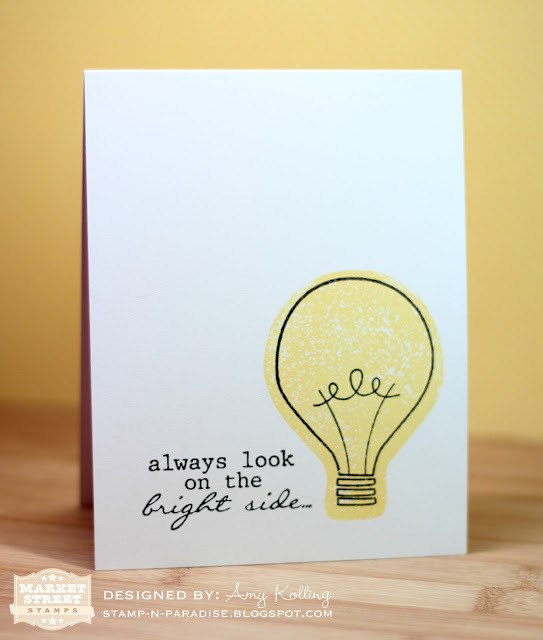 After stamping the outline, I turned over the stamp and stamped the actual lightbulb image inside the outline! LOVE out it turned out! Such a great CAS card!!! Now let's see your Market Street Stamps in action this month for the Block Party! Yes you can win because my dear friend, Renee, was chosen last month as a Guest Designer and she's been getting ready for her time on the MSS blog! Let's see what you can do! Hi everyone! Here's to a great start to your weekend! We start our baseball season this weekend at a baseball tournament out of town. No sand this weekend but lots of sun to be had I'm sure! Can't wait to see how the Bulldogs do on their first outing! 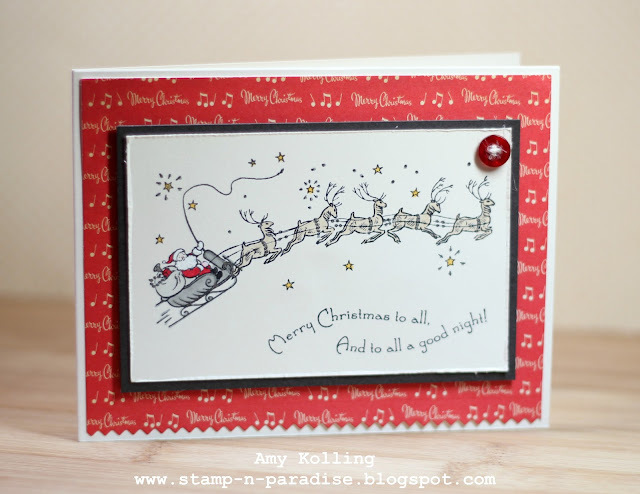 Here is my first card using a wonderful traditional image of Santa Clause and his reindeer called Santa's Flight from A Muse Studio. I went with traditional colors and kept it simple. What you can't see on the card is all the silver accents I added to the sleigh, stars, and reindeer. Much better in person! 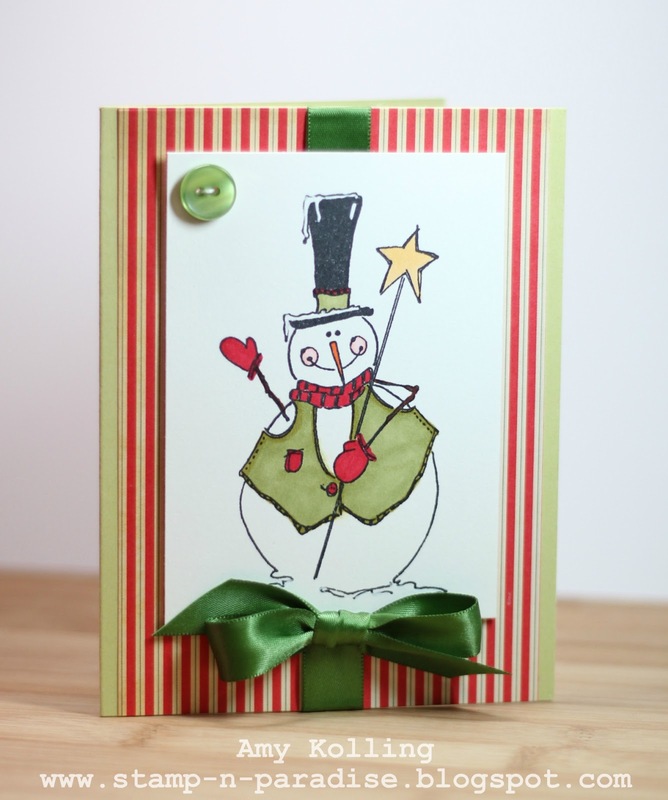 My second card uses an adorable folk artsy snowman image from Print Works. Again kept it simple except for some Copic coloring. I love how the image takes center stage and so I left it sentiment-less on purpose. This could be used not only for Christmas but for a Thank You or just Winter Wishes. Well, you need to go check out the rest of the 12 Kits of Christmas blogs for tons of holiday inspiration! We'll see you next month where we have another new hostess and some great new goodies to use! 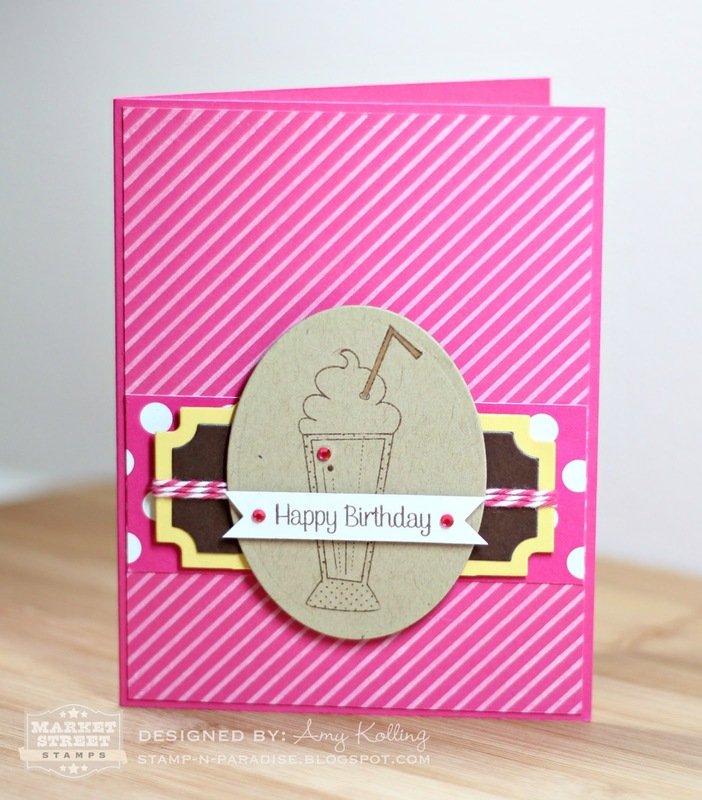 And just so you can see the new Background stamp, Candy Stripes, here is the card I shared yesterday as a sneak peak! Now you KNOW you want to win some of these new stamps........here's what you've got to do! Each month, we give away one of each set showcased to one LUCKY commenter! •Earn THREE bonus entries for sharing this giveaway on your Facebook page OR Twitter account (be sure to let us know if you do in a separate comment on the post over at MSS)! •You have through Wednesday, March 28th to enter to win each set. Hi everyone!! I am so glad to be home! We had a wonderful trip to Aruba! I am planning a post with pictures of our trip soon, so stay tuned!! 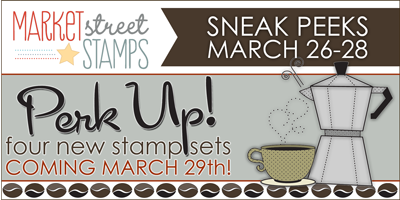 So welcome to Day 2 of the Market Street Stamps March release! I had so much fun with the stamps from this release prior to my vacation and can't wait to start inking them up again now that I'm home. Today we are showcasing a stamp set that has been on my list for Angelica to release: a SENTIMENT ONLY set! Yippee! 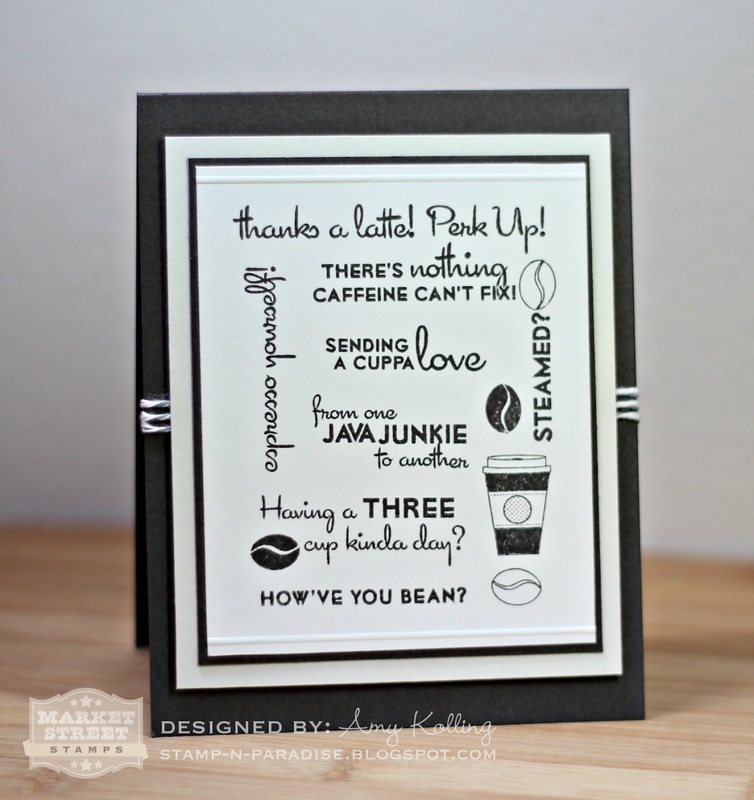 Now you will have a GREAT sentiments to go with any of your existing Market Street Stamps! Here I had to use more of the great images from the new set, Daily Grind, and paired them with the new sentiment set called Simple Salutations. For my other card, I used the adorable shake image from Daily Grind for this fun color combination and I just may have snuck in another new stamp on this card! hehe.....you'll have to wait and see! And of course you want to win this new set right? Here are the details of the giveaway! We'll see you back here tomorrow night, same time! •Earn THREE bonus entries for sharing this giveaway on your Facebook page OR Twitter account (be sure to let us know if you do in a separate comment on this post)! 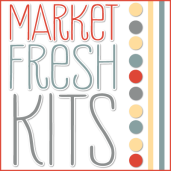 Today marks the first day of the March New Release from Market Street Stamps! I can not wait to show you what I've made the past few weeks with these! I finally get to share with you a card made using the newest stamp set from Market Street Stamps called Daily Grind. You like coffee? Well, you will LOVE this set! Did I mention that it's a BIG set?? Well, it is! I have to givce a bit of background for my card. I have been seeing Subway Art everywhere lately....on Pinterest, Ebay, even in my church sanctuary! So I found an image from Pinterest and this is what I came up with! Well, I'd love to hear what you think! Have you been seeing Subway Art around? I'd love to see your take on this..........so if you make up your own Subway Art......let me know. I'd love to come see! 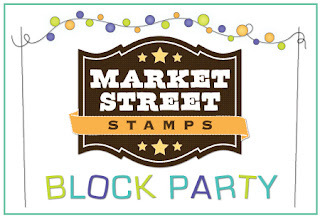 See you tomorrow for Day 2 of more goodies from Market Street Stamps! Lil' Inker Designs March Blog Hop: Final Day! Hi friends! 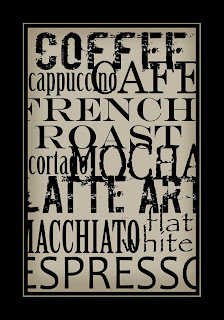 Let's see........I've shown coffee goodies, Easter goodies, and ways to use such in non traditional ways. Today is the last day of the New Release from Lil' Inker Designs and now these goodies can be in your hands to create with too! 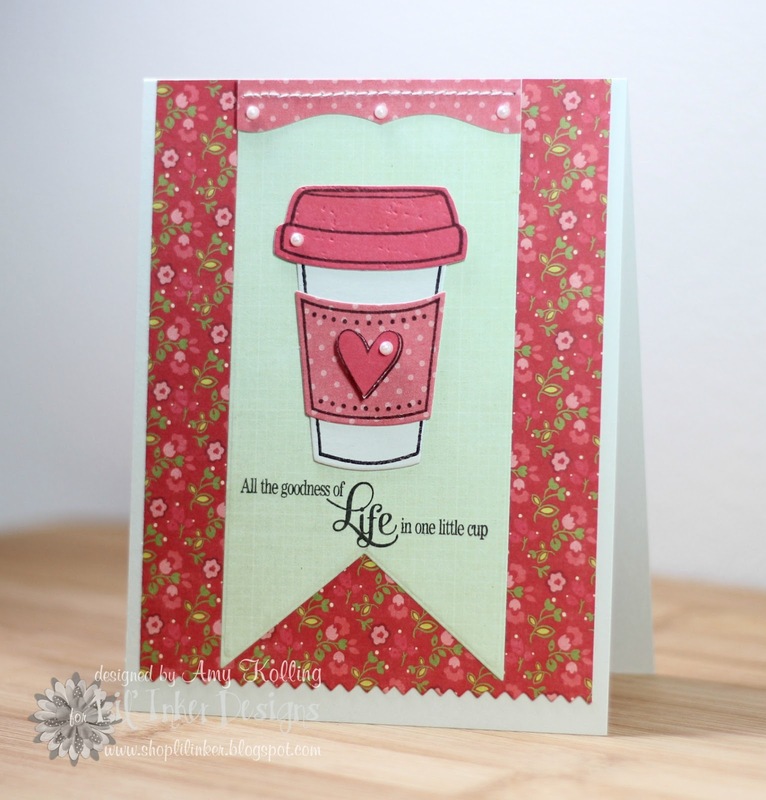 You should have arrived from the sweet Alicia Thelin's blog along the blog hop. Today we got to do like an "anything goes" type of post only using the new goodies! I decided that since I hadn't used the Hoppy Bunnies set for it's inteded use, I used it. I adore this mini basket that is included with this set! Broke out the copics folks for this one! I'm getting kinda use to using my pattern paper now that I don't have to go look at the pack to write up my supply list anymore! This paper is from the Baby Steps collection by Simple Stories. I have so enjoyed sharing these great new releases for Lil' Inker Designs that now I want you to be able to ask well! 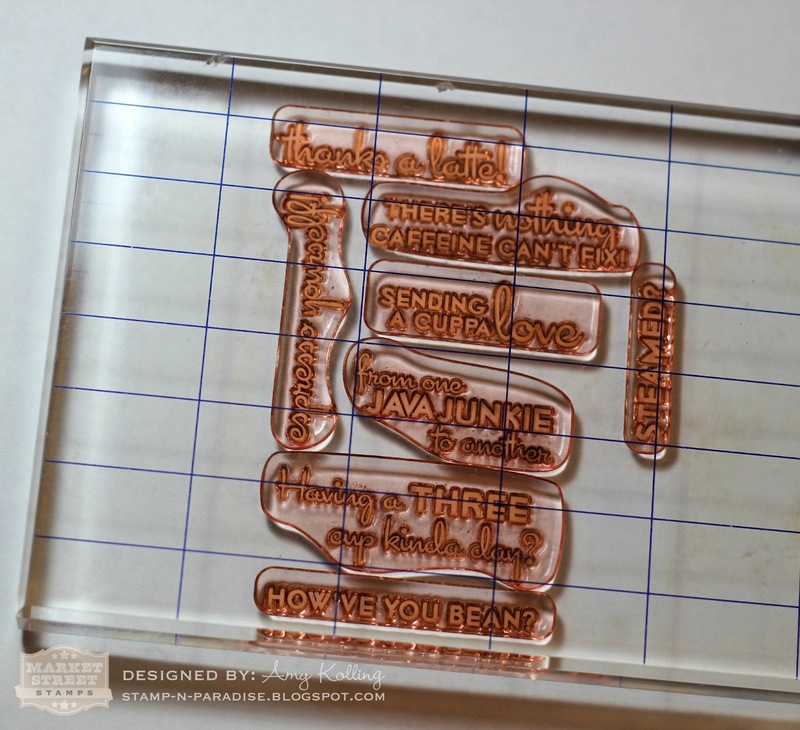 Hop on over to the Lil' Inker Designs shop to purchase your own dies/stamps!!! Your next stop in the hop is my friend Jen Carter! Thanks so much and have a great day! Welcome to Day 4 of the Lil' Inker Designs March Blog Hop! 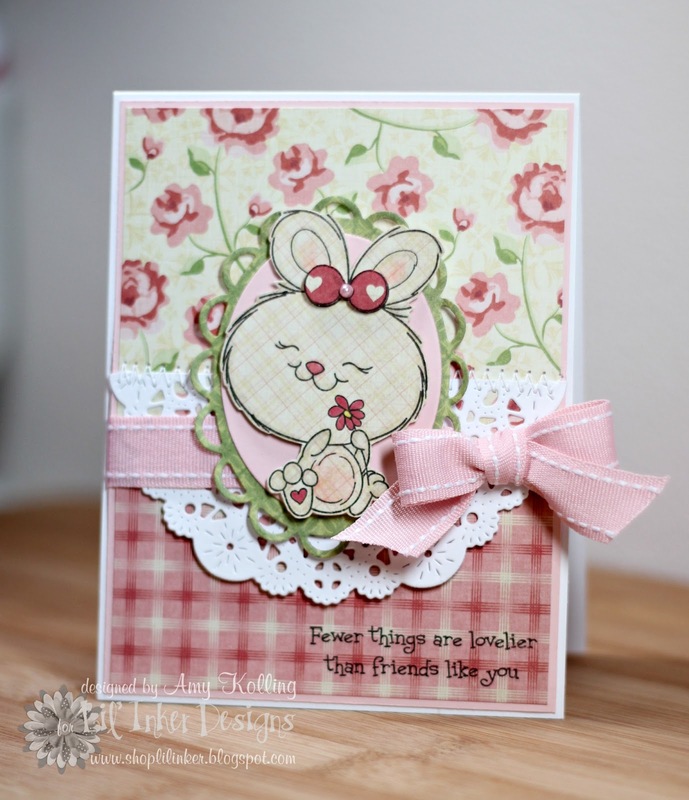 Today I get to share a card made using an adorable large set of BUNNIES from 2 cute ink and Lil' Inker Designs. You should have arrived from the Lil' Inker Designs Blog during today's stops. More cuteness coming your way with this ADORABLE spring set of bunnies, basket, and eggs....Oh my! I decided for my bunny image that I did not want to color it in and did not want to use the bunny for an Easter card........So I instead I went for a sweet "friend" card. I LOVED the layout by Debbie Olson on her card HERE, that I just had to case that layout! I paper pieced my bunny with some fun paper by Cosmo Cricket called Tea for Two. (gorgeous papers) I then did a quick paper piece to her bow and added a pearl. For just an added bit of color to the pattern, I blended in some very light Copics to the bunny. That's it from me today but I know the rest of the DT that are showcasing Bunnies today will have some more great inspiration for you! Remember that there will be prizes during the new release so please check the Lil' Inker Designs Blog for all the details! 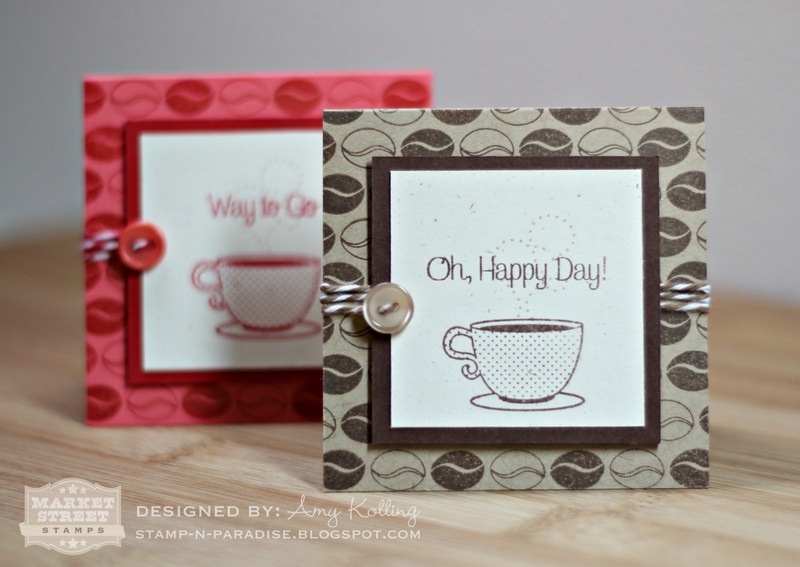 Your next stop on today's blog hop is fellow DT, Sarah Jay! Thanks for stopping by today and remember that tomorrow is the group post! 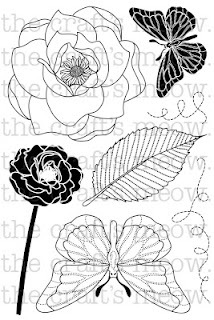 The Craft's Meow New Release Blog Hop!! Hi everyone! I want to thank you for joining me this week as I joined the fabulous Design Team over at The Craft's Meow! It has been such a pleasure to help TCM celebrate their Birthday! Today we are in the midst of the new release Blog Hop. You should have arrived from the lady who does vintage so elegantly, Ivana Camdzic. If you did not, you really need too! Today we got to choose any of the sets releasing and use it for our Blog Hop project. I really needed to get a jump start on some of the other cards I will be needing, so I decided to use Beautiful Spring for my Father's Day card this year. I decided to do some simple "masking" technique and stamp the leaf image down the side of my image panel. 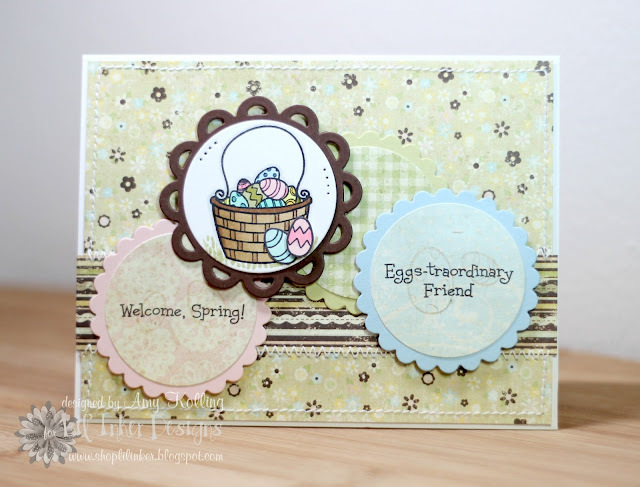 Here is the stamp set Beautiful Spring that I've used for my card. Now get ready for this.........Do you want to win ALL 6 of these new set?? To be eligible, you will need to visit & comment on each blog on the hop!! 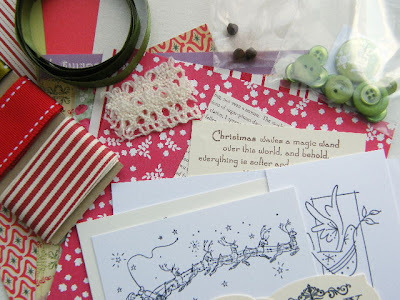 If you get lost along the way, make sure to visit The Craft's Meow blog for the full Blog Hop list! But your next stop is Iwona Palamountain and you don't want to miss what fabulous project she has for inspiration today! Thanks so much for joining me this week and for all the wonderful comments.....I've enjoyed reading every one of them! As we continue The Craft's Meow Birthday Celebration, today's challenge is all about BIRTHDAYS! Here is the Birthday Celebration inspiration photo. Come celebrate with us! All of this week's challenges will remain open unitl 9:00pm PDT, Saturday, March 31st. Please check out TCM blog for more details. You say.....I don't have any TCM stamp to play along. Well, if you Like us on Facebook you will receive not one but two free digi images designed by Karen Baker for The Craft's Meow!!!! If you're not on Facebook, then you can email thecraftsmeow@gmail.com and they will be emailed to you. Remember to win a prize, you must have used a TCM stamp or digi! Wow, I love today's set and it's so trendy and "IN" right now! Hexagons....and lots of them! My background was created with a hexagon background strip heat embossed with white Filigree Embossing Powder. 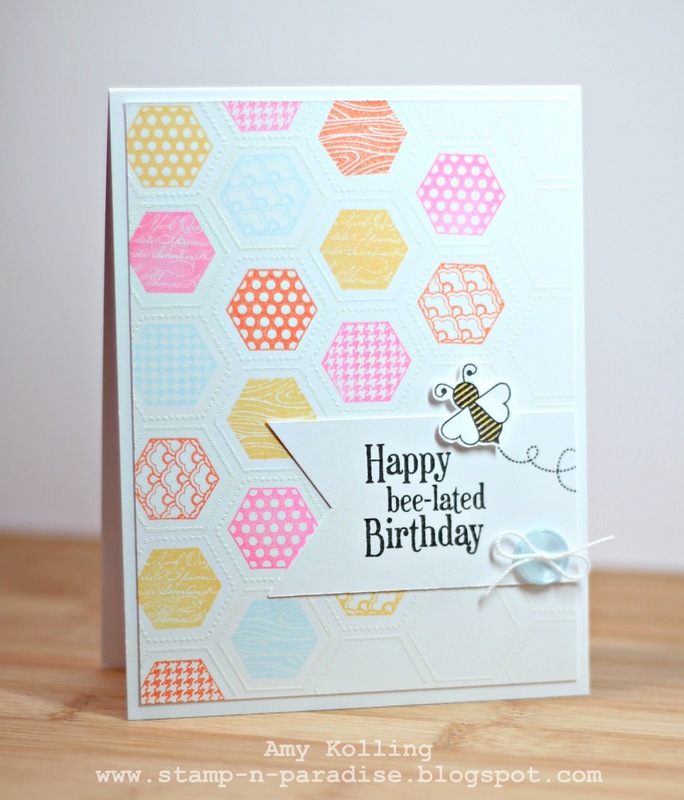 Then I just added color with the smaller hexagon stamps randomly stamped using the colors from the Birthday celebration photo. My sentiment was stamped on a hand cut banner to represent the banner in the birthday photo above! Remember, if you want your chance at winning this set featured today, you must go leave a comment over at TCM blog! And while you are there, why don't you play along with a TCM challenge?? Who doesn't love a FREE stamp set? Thanks so much for stopping by! 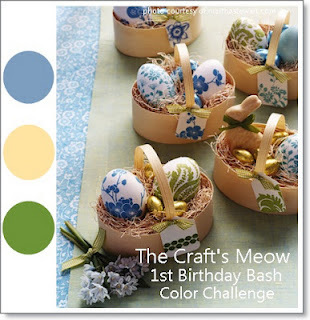 Welcome back to Day #3 of The Craft's Meow birthday celebration and March new release! Today we are getting ready to show you some CUTE CUTE stamps by non-other than Jenny Suchin. I am a huge fan of her signature owls and these 2 sets are some of my new favorites. I'm so glad to see Jenny having such success with her line at TCM. We parted ways when the Wee Memories challenge blog ceased but we've remained blog friends since. Have any of you played along with TCM yet and their challenges going on? Today's is a color challenge and is perfect for those spring/Easter cards! You say.....I don't have any TCM stamp to play along. Well, if you Like us on Facebook you will receive not one but two free digi images designed by Karen Baker for The Craft's Meow!!!! If you're not on Facebook, then you can email thecraftsmeow@gmail.com and they will be emailed to you. Remember to win a prize, you must have used a TCM stamp or digi! I just love this first one..........Spring is Here. So many adorable little images in this set. 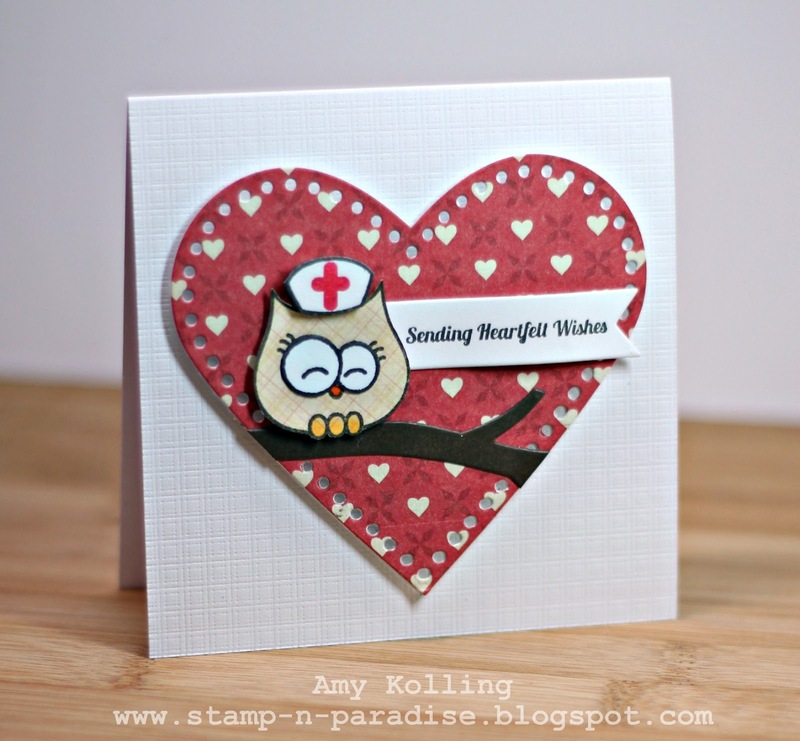 I chose to use the mailbox and letter images as well as her little owl! My mailbox was paper pieced using the Cosmo Cricket Tea for Two papers. The next set.........Get Well Soon, has a special place in my heart! I am a RN so this set will gets LOTS of use!!! I sent for a more CAS card but of course had to add some texture! Remember, if you want your chance at winning either of these sets featured today, you must go leave a comment over at TCM blog! And while you are there, why don't you play along with a TCM challenge?? Who doesn't love a FREE stamp set? Thanks so much for stopping by! 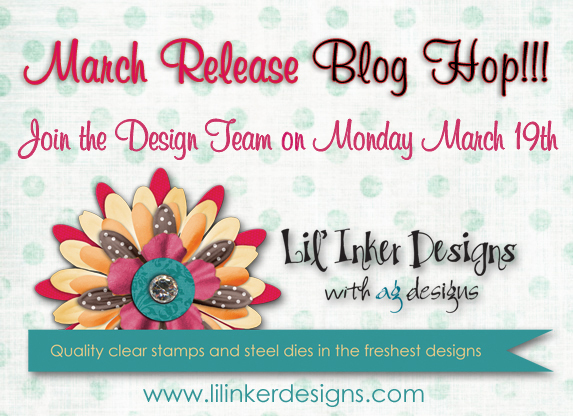 Welcome to the Lil' Inker Designs March Release! Wait till you see all the ca-yoot stuff Laura has been "brewing" up! Literally! LOL Today we are sharing the newest stamp and die set called Coffee Cozies. 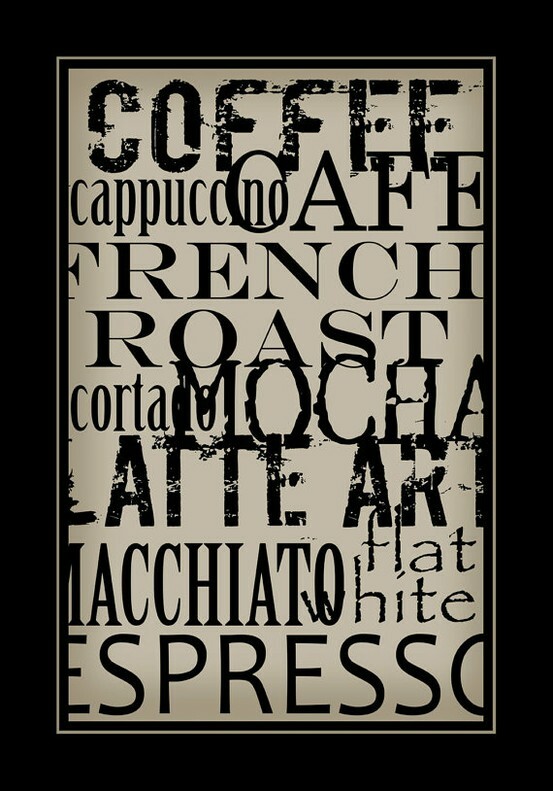 This set is absolutely jam packed with fun stuff for those that LOVE coffee. You should have arrived here via Alicia Thelin's wonderful blog! Let's get started!! My first card uses the Coffee Cozy dies to make up this cozy. A little pearl accents here and there added just the right touch. I've layered the coffee cozy on top of the large flag die from Flags and Tags. Laura has done it again with her gorgeous sentiments for this set. I want to mention that this set of dies has "registration marks" on it for easier alignment but by no means do you have to use them for lining them up when stamping. 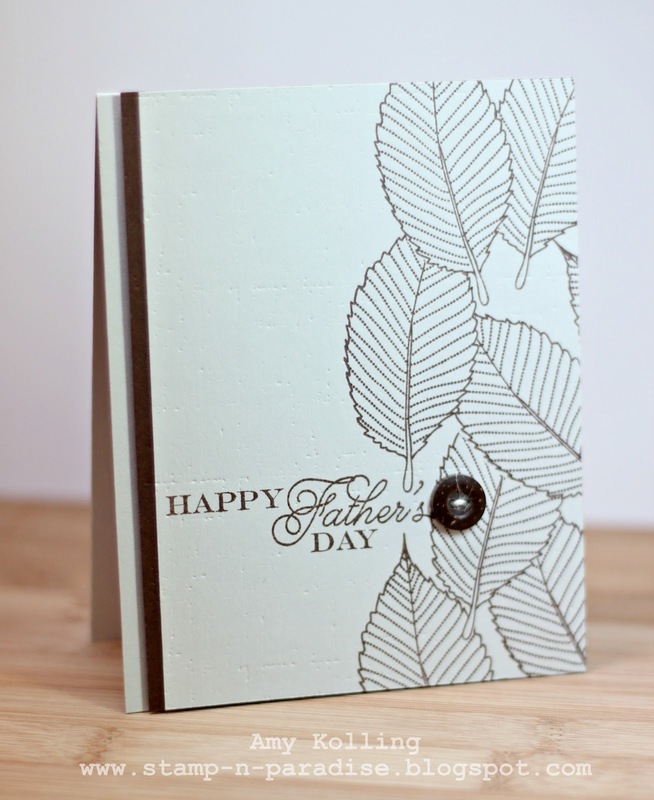 I had NO trouble at all stamping my images over the die cut pieces. Laura will be sharing a video on just how to use these new "registration marks". My second project uses the coffee cozies WITHOUT the dies. I don't mind at all to cut things out and these are a breeze. I paper pieced the cozies and added some lids with pearl accents again. I jazzed up the chevron cozy with some Cream Button Twine. I just love this sentiment.....it's so punny! Here, I used the smaller flag from Flags and Tags for the sentiment. That's it from me today but I know the rest of the DT that are showcasing Coffee Cozies will have some more great inspiration for you! Remember that there will be prizes during the new release so please check the Lil' Inker Designs Blog for all the details! 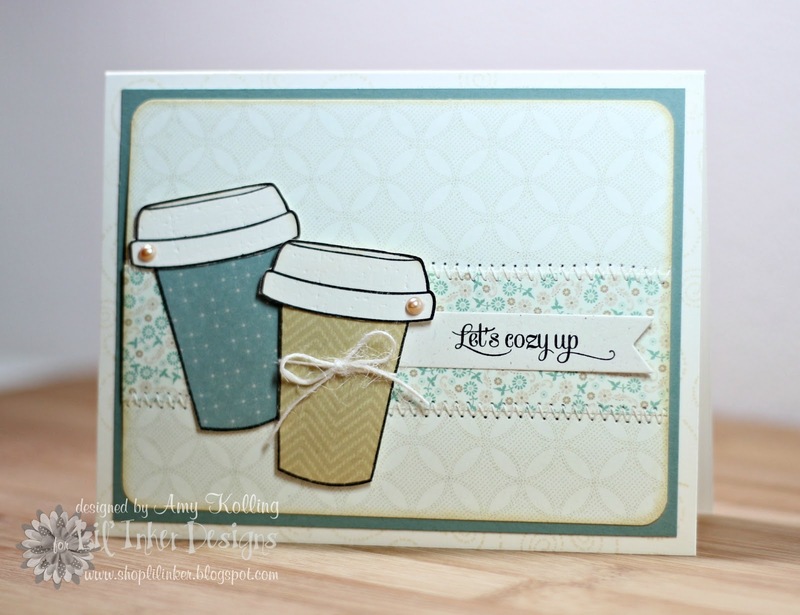 Your next stop on today's blog hop is my best friend, Jen Carter! Let's pop over there to see what she's got up her sleeve! Hey friends! So I wanted to send out a great big THANK YOU to everyone for stopping by yesterday for Day 1 of The Craft's Meow newest release for their Birthday Bash! 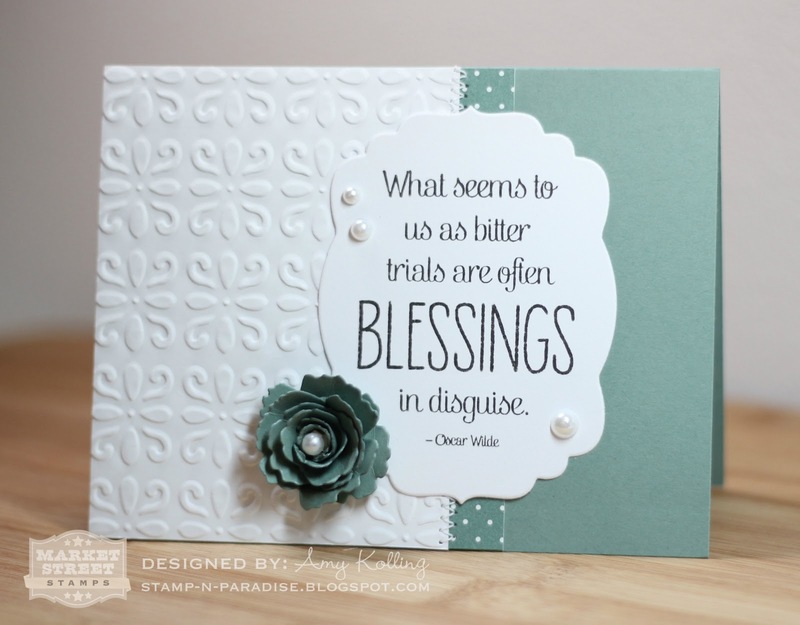 Today I bring you yet another fabulous stamp set from Nina Brackett of Nina B Designs called Cherished. 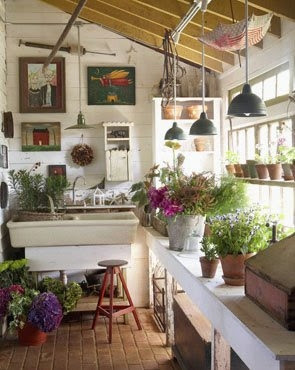 If you like floral and collagy, then this going to entice you! Such detail in these stamps.......this set also comes with lots of great words to make this as personalized as you need for that special woman in your life. You know Mother's Day IS right around the corner! Again today, I broke out those Distress Inks for my flowers and gave them LOTS of dimension with foam tape on several layers. My background was embossed with white filigree embossing powder and then Antique Linen ink was sponged over the embossed image for that weathered, vintage look. Some of you know that this color combo just happens to be my all time favorite! Today I've used the inspiration challenge for my card. 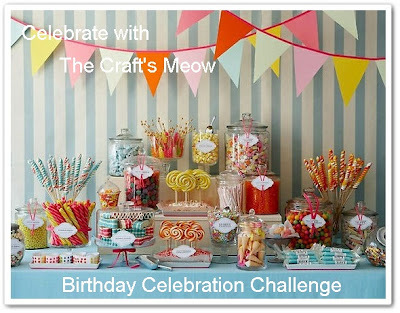 To continue with The Craft's Meow challenges this week for their Birthday Bash, today is an inspiration challenge for your eye. You could totally go vintage or earthy or floral! Let's see what you can do with it! Check out TCM blog for challenge details and deadlines. Remember to leave your comment on today's post for your chance to win that days featured stamp set! All comments need to be left by 9:00pm PDT, Friday, March 23rd on TCM blog. Tomorrow marks another day.........See you then! Well today is the day! Today marks Day 1 of the festivities around here for The Craft's Meow Birthday Bash and their new release! Can I get a woot woot? Alright, first up did you see the newest designers for TCM?? Please welcome: Karen Baker (stamp illustrator), Amy (Aimes) Wanford, Jennifer Cuthbertson, and Jackie Rockwell. These ladies are way talented and I get to be among them for the month as a March Guest! Today I get to show you a project using 2 new sets designed by Nina Brackett of Nina B Designs called Beautiful Spring and Mother and Father. I LOVE creating cards like todays! You know why? I love to add embellishments and layers. These types of sets are just my style....literally. 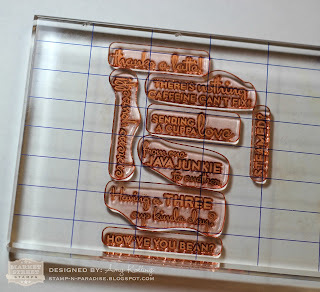 I could NOT wait to get my hands on this stamp set to use my most favorite technique on: Emboss Resist. **I did a photo tutorial on it last week and you can find it HERE. It was also a featured technique last week over on the Moxie Fab World Facebook page! ** I've used the sketch below for my card today. The Craft's Meow, in celebration of their Birthday during this week, is having daily challenges! Today's challenge is to use the following sketch by Amy Tsuruta. For complete rules on the challenge(s), please check out TCM blog for details. There will also be prizes daily so leave those comments for your chance to win that days featured stamp sets! The deadline to leave those comments is 9:00pm PDT, Friday, March 23rd. 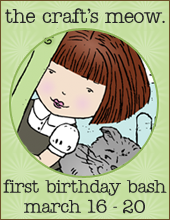 Please stop by again tomorrow for more from The Craft's Meow Birthday Bash!! !